I was fresh out of Missoula, Montana having just quit my winter seasonal job driving snow-cats at a local ski area to come to Utah and take a job as a seasonal river ranger on Desolation Canyon. The summer before I worked as a backcountry ranger in Escalante. One of the seasons activities was a BLM recreation workshop at Kodachrome State Park where I met Pam Swanson; the permit manager for Deso. I asked Pam about job opportunities on Deso and she referred me to Dennis Willis, saying that she thought there would be several opportunities in the upcoming season. I called Dennis and asked him if he’d be available for lunch in the coming days. He said he'd be happy to meet with me so my friend Lou and I made a weekend drive to Price, Utah, via Arches. Despite having never even heard of Desolation Canyon, that lunch break would prove to be the beginning thread of a long string of seasons as a BLM River Ranger. I was to report for work in late March, which I did, making sure to not be late. I did some paper work, took a driving test, and met a few people. 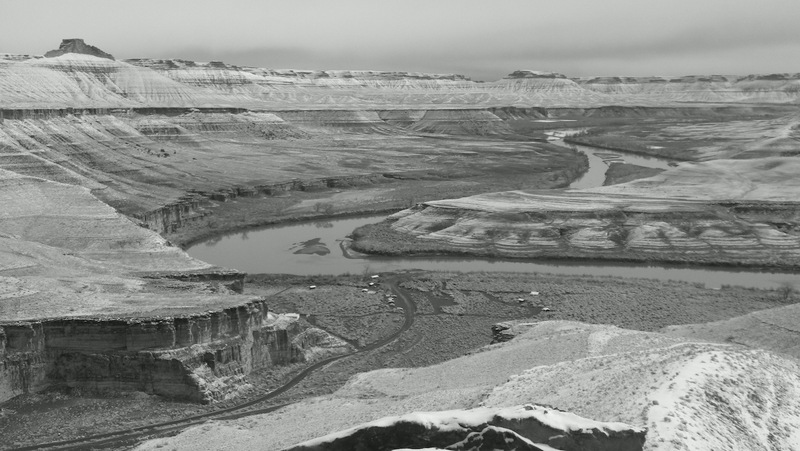 The next day I loaded a weeks worth of rations and gear into a government 4x4, and departed Price with Dennis, bound for the remote Ranger Station on the Green River, called Sandwash. We checked the oil and spare tire, filled up with gas, and turned off the pavement near Wellington. We drove into the headwaters of Nine Mile Canyon, and began a long descent into red rocks that didn’t really impress me after having spent the previous season in Escalante. Dennis tried hard to give me a good impression, stopping frequently to see petroglyphs, and ancient Fremont dwelling sites. I had mixed feelings about what I was getting into. It was going to be a long shot, for this to top the grandeur of the Escalante Canyons. It didn’t beat the scenery of Escalante, but that wasn’t the point. After two and a half hours of driving remote dirt roads and tracks we passed a dirt airstrip and stopped at an overlook where Dennis told me to get out and go have a look. At the edge I looked down about 700 vertical feet, at Sandwash Administrative site perched on a fan of alluvial debris, having spewed out of Sand Wash over centuries past. The house sat back several hundred feet from the Green River. The view in the distance was stark and desolate; not even a fence post in sight, very befitting name I thought. The vegetation only grew along the river and was still locked firmly in the dormant grey of winter. Away from the rivers edge was a featureless grey-scape of rock as far as I could see; about 20 miles distant. The grey of earth and that of sky was indecipherable. I felt the bitter knot of mistake in my stomach that I had traded Escalante, and previously the Pacific Northwest for this. I didn’t like it, but told myself to be patient. I remember the same feeling the first time I tasted strong black coffee, and again the first time I tasted beer. I didn’t know it at the time, but Sandwash would prove to be a stubborn acquired taste that took me most of two seasons to begin to appreciate. I returned to the truck and got in. Dennis didn’t say anything. I hoped he would interpret the silence as something akin to being road weary. It took us another 30 minutes of grocery bouncing to reach Sandwash Ranger Station. Alan Jackson came onto the porch to greet us, not the singer of country songs, but who most people know as the guy that was at Mineral Bottom during several summers. He immediately went to work speaking of his latest theories conjured up during a winter at Sandwash. I must have said something inappropriate because he became abrasive and unfriendly. Later I found out that it’s a pretty bad idea to call crazy someone’s ideas after they have just spent a winter alone at Sandwash. Sorry Alan, I didn’t mean anything by it. Dennis gave me a tour of Sandwash while Alan loaded his gear into the truck to return to town for the first time in weeks. After my tour, he and Dennis headed out so they could make it back to town before dark. I stood on the driveway in front of the porch and listened to the truck drive away. I saw no one during my first week as a river ranger at Sandwash. I was 75 miles from pavements end, the nearest telephone pole, or help in case of mishap, even if I had a phone. Almost daily, I hiked far from the station, to a rim rock where I’d sit for a long time. I would look at my lonely little desert outpost and think. I thought the greasewood was awful, and the rocks uninspiring, especially compared to Escalante. For several reasons I regretted leaving Montana. I was more than ready to go when Gordon, the next ranger, came to relieve me a week later. Admitably, my first shift at Sandwash wasn’t very enjoyable, but little did I know what a formative place it would be prove to be in my life outdoors. I couldn’t have guessed how I would learn to appreciate the solitary sight and sound of distance, the smell of the muddy desert, the observation of a weeklong growing season, the big dipper as a timepiece, and that my relationship with the land is reciprocal. When I sense how all the pieces of this landscape relate to each other I see something greater than the sum of its parts. Perhaps, my years at the government outpost called Sandwash have been the only way that I ever would’ve slowed down enough to discover this.